As was anticipated by law-enforcing agencies, the 24-hour Delhi bandh called by traders was marked by incidents of vandalism, clashes, stone-pelting and traffic disruptions in many parts of the city. The police detained about 1,500 people following the vandalism of public transport by protesters who took to the streets against the sealing of illegal shops in the Capital. 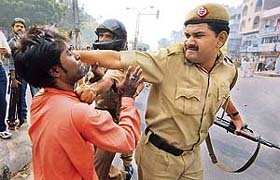 LONG ARM OF THE LAW: Policemen rough up a trader in New Delhi on Tuesday. The Central Board of Trustees of the Employees Provident Fund Organisation (EPFO) today deferred a decision till next month on the interest rate to be given to four crore subscribers for 2006-07. The Delhi High Court today dismissed the application of Jessica Lall murder case key accused Manu Sharma for shifting his appeal from a Division Bench hearing after a report in a newspaper had made certain references about a past incident pertaining to his bail plea. Even as amendments had been made to the Emigration Act to protect Indian workers from exploitation by employers abroad, the Congress-led UPA government proposes having social security pacts like the one intialled recently with other EU countries as well as putting in place labour agreements/MoUs with the UAE, Saudi Arabia, Kuwait, Bahrain and Malaysia. Chinese President Hu Jintao will pay a state visit to India from November 20-23 and hold talks with Prime Minister Manmohan Singh and other leaders on various aspects of Sino-Indian relations, including the vexed border issue. Although it was slow in launching its campaign in Punjab, the Congress is feeling relatively more confident now as it is banking on factionalism in the Akali Dal ranks to see it through next year’s critical Assembly elections. A Chandigarh-based bureaucrat’s brothers have been allegedly hunting protected animals, including Schedule I animals like leopards and chinkaras (Indian gazelle), for almost 20 years. 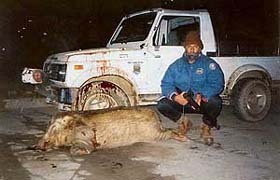 Yadvinder Singh Pirzada poses with a wild boar killed in Ropar and brought in his Gypsy to his house in Chandigarh. The deadly disease of AIDS has swallowed four persons, including two breadwinners of a Dalit family, in this sleepy village in the border district of Taran Taran in the past five years.